OK. So, uh, don’t eat this. My husband is starting to get that glazed look in his eyes when he reaches for what used to be store-bought items but have now been replaced with Michelle’s new home-made-chemical-free-and-cheap-as-heck health and cleaning products. Yup. I’m on a role. 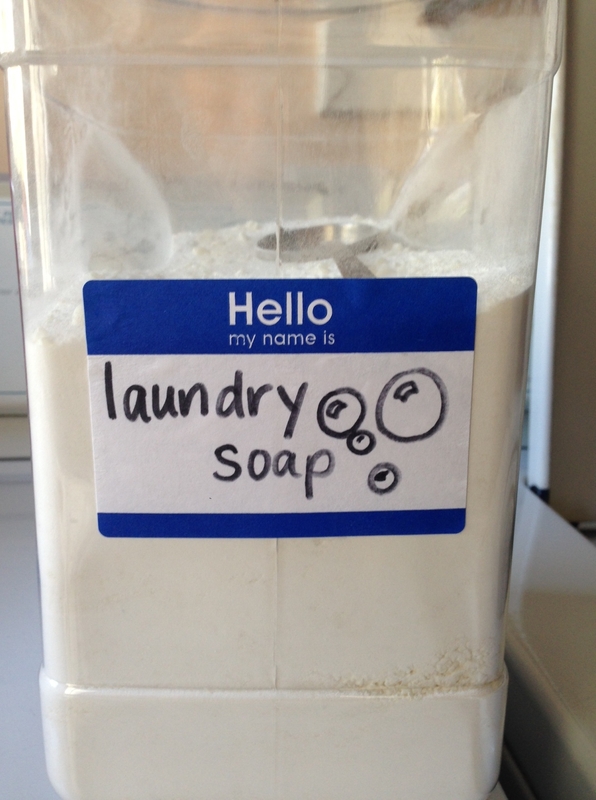 My new natural laundry soap is easy to make, cleans just fine and is loads (get it?) cheaper than anything you can buy off the shelf. And if you’re not interested in actually making your own, I’m in the process of getting my Cottage Food Operator’s permit (OK, yes, we already agreed that this is not edible) which will allow me to sell prepared foods/other items from my lovely blue-kitchened home. Check me out, sista! My product line name is “Gladys told Zelma” which is also a new page on the top of my blog. Click on it to see what the deal is. Go ahead. It’s fun. Ingredients: one bar natural soap (I used Dr. Bronner’s Castile Citrus,) 2 cups Borax, 2 cups Washing Soda*. Directions: Grate your soap with a food processor or cheese grater. Mix with the other two ingredients and honey you ‘R done. Yup. It’s that easy. Use one rounded TBSP (that’s all, seriously) per load. It won’t make suds like commercial brand detergents and that’s OK. It’s because it doesn’t have all the chemicals in it that they use. Tips: I like the citrus soap because it has a fresh scent, but it’s not perfumy. The fragrance comes from essential oils. If you grate your soap by hand, use the large side of the grater and then rub the soap bits between your hands to break them up a bit more. The first time I made this mixture I used the tiny little side of the grater. The soap bits looked tiny and fabulous, but it took me FOR-EH-EH-EH-VER. ** What the heck is “washing soda?” You can order Arm and Hammer’s Washing Soda online if you can’t find it in a local store. OR, you can actually make your own. Just take two cups of baking soda and heat at 400 degrees for about 30 minutes. Google it if you don’t believe me or just look here. My Grandfather, former Chemistry and Physic’s teacher would be so dang proud of his little Liberal Arts lovin’ granddaughter for sharing this! Final tip: if you would like to use this detergent but have absolutely no inclination to make your own… lemme know! I can hook you up!